The body of Polynices, Antigone's brother, has been ordered to remain unburied by Creon, the new king of Thebes. Antigone's faithfulness to her dead brother and his proper burial, and her defiance of the dictator Creon, seals her fate. 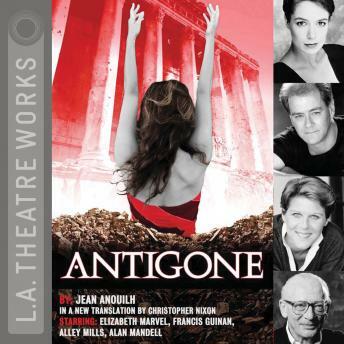 Originally produced in Paris during the Nazi occupation, Anouilh's Antigone was seen by the French as theatre of the resistance and by the Germans as an affirmation of authority. Includes an interview with translator Christopher Nixon and director Brendon Fox. Also includes an interview with Ned Chaillet, a playwright, radio producer and director for the BBC. Chaillet is the former Deputy Drama Critic for the Times of London and the London theatre critic for the Wall Street Journal-Europe. He spoke with us about Antigone in the context of World War Two, the differences bewtween the original myth of Sophocles and the Anouilh version, and Anouilh’s influence on later playwrights. Directed by Brendon Fox. Recorded before a live audience at the Skirball Cultural Center, Los Angeles.